Boy did I make a mess making a mess of pâté last week! Pâté and I were at odds from the start because of its tendency to contain liver and my propensity to loathe liver. When I was young, my mother made me eat calf’s liver about once a month for the iron. To Mom’s credit, she’d do all the right things to make the stuff palatable: soak it in milk to leach some bitterness out; gently fry it in butter with onions so as not to overcook it; and serve it with the universal fixer – bacon. I did, in fact, test out three chicken liver pâtés on my friends. This is the one, adapted from a recipe on food52.com, that my liver-loving judges liked best. Use a pair of kitchen scissors to trim any sinews from the livers and dry well with paper towels. Season the chicken livers with salt and pepper. In a large skillet, melt the butter and olive oil over medium-high heat. Add the shallots, garlic cloves, anchovies, capers and sage and cook until shallots are lightly browned, 5-6 minutes. Add the chicken livers to the pan. Cook until browned, 5-6 minutes. Add the white wine and cook, stirring until the wine is absorbed, 7-8 minutes. Use a wooden spoon to break up the livers as they cook. Remove the skillet from the heat and transfer the liver mixture to a food processor. Process until very smooth, then add the lemon zest and cheese and process again. Season to your taste. 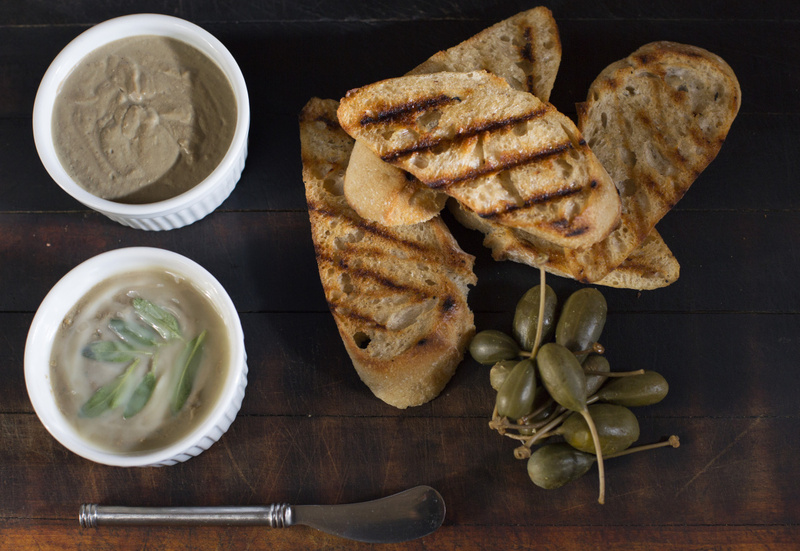 Serve warm or at room temperature as a spread for grilled country bread. To store it in the refrigerator for up to a week, scoop the pâté into a ramekin, pour a thin coat of melted clarified butter over the top (decorate with small sage leaves if you like), and wrap tightly. My older (not wiser, mind you) brother, Shawn, would steal my bacon allotment. I’ve not forgiven him for that. Or for the time he dared me to lick a frozen metal pole and half of my tongue stuck there. OK, maybe a little wiser. But the temporary alteration to my taste buds didn’t diminish my displeasure with the bitter graininess of that month’s liver allotment. I still don’t like liver, whether it comes from a cow, chicken, duck, goose, lamb or pig. In its presence, my taste memories scream “Danger, Will Robinson! No, Will Robinson! Danger!” before they short out from sensory overload, spin my head around and roll me away from the table like the “Lost in Space” robot B9. But eschewing offal because I thought it awful as a kid isn’t a very green eating practice. If you eat animal protein, then you need to at least consider eating all of the edible parts of the animal. I posed a question about pâté’s place in the sustainable meat supply in Maine to Thistle Pig chef Ben Hasty, who regularly receives sides of cattle and whole pigs from his father’s farm just down the road from his South Berwick restaurant. Hasty makes use of tongues, hearts, cheeks and livers on daily charcuterie plates. Is liver a delicacy or an obligation in your mind? 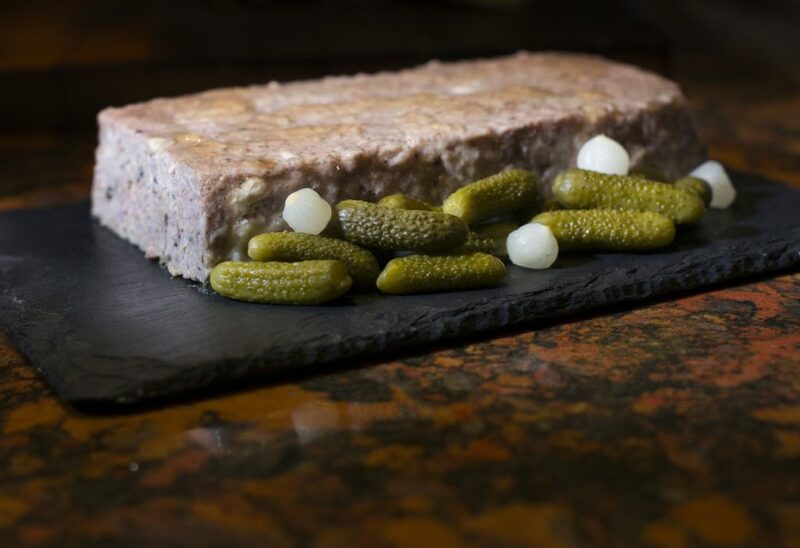 His pâté maison – a classic French country pâté that he can’t remove from the menu due to its popularity – comprises pork shoulder, fatback and liver. It’s flavored with garlic, black pepper, ginger, nutmeg, cloves, cream and two types of salt: kosher salt for flavor and sulfate-containing pink salt to help preserve it. To make it, Hasty starts with ice-cold ingredients, which he grinds into a mixing bowl set inside an ice bath. Keeping the ingredients frigid but not frozen helps the meat parts stay emulsified in the fat parts so that the pâté comes out more silky than grainy. He cooks it very gently in an oblong terrine in a water bath in a low-temperature oven. “Crispy caramelization on a meatloaf is great, but on a pâté it means you’ve cooked it at too high a temperature,” Hasty said. You like meatloaf, why not put your big green-eating pants on and make one with a little liver in it and cook it gently, the angel on my right shoulder prods. So I call Bisson’s Meat Market in Topsham. “Do you have pork liver?” No. “Do you have back fat?” The stuff that hangs over a bad fitting bra? No, I do not, but we do have fatback. “What about caul fat – the lacy organ fat Julia Child says I can wrap around a country pâté to help keep its shape but that will melt as the pâté cooks?” No, but we have lots of stuff we call fat. Butcher humor! Ha, ha. Given the shortage of pork liver, I bought an abundance of chicken liver from Applecreek Farm; I buy a chicken from them almost weekly. The livers come frozen in large amounts, and I bought five pounds. The chicken liver motherload led me to expand my liver plans. I would attempt both a chicken liver pâté and a country pâté. The first would be a quick and dirty experiment involving only a frying pan, a blender and a couple of internet recipes with five-star ratings and plenty of comments on what could go wrong and what could be better. And the second being a project that would take three days, require a meat grinder and matching loaf pans, and yield enough pâté for one huge holiday party or six small ones. • Every friend whose grandmother made chopped liver has a strong opinion on what’s best in a pâté. • Raw liver is not an ingredient for the squeamish. • The brandy called for in many pâté recipes quells a queasy stomach. • It’s not wise to leave pâté-making gear unwashed in the sink before rushing off to a dinner party because you’ll need more brandy for your newly queasy stomach when you return. • While most people are willing to help you rate the three liver-containing pâtés put in front of them, there are many others, who regardless of how hard they try to force the issue with crazy kitchen projects, just don’t like the stuff. Well, maybe I’m projecting on that last point. But as a committed liver hater, I’m resolved to rack up sustainable eating points in other parts of my diet to make up for my aversion.